Visit Buzz Korea's Interactive website here! The official title for 2PM’s Japan arena tour has finally been decided, along with additional tour dates and other tour details! This is general information. Please visit their official JP website (2pmjapan.com/live) for further details not posted here. 2PM’s Taec Yeon had his picture taken at his school, Dangook University. Recently on one of the online community websites, a photo of Taec Yeon in the title of “Taec Yeon, working hard at school” was posted. In the pictures, Taec Yeon is smiling brightly while buying something at the cafeteria and his focus is on his studies while in his classroom. People responded, “it looks like Taec Yeon is a hard-working student,” “it looks good that he is being kind to his fellow students,” “I should go to Dangook University to see Taec Yeon,” and so on. Taec Yeon is currently enrolled in Dangook University, starting in ’07, majoring in Business Administration. Q: Oppa! Is it OK to put our hands up with you from Japan? > Q: For you, what are fans? NK: Mothers who cook meal for me. Q: I'm a big fan of J.Y.Park. What is his weak point? Q: Where is your twitter name came from? JH: Someone used my name, so I wanted to claim that I am the real one. Q: When was the first time you sung in front of people? JS: That was in the school festival when I was third year in junior high school. Q: What is in your mind when taecyeon is standing on your back? CS: Nothing special. Maybe "Ah, he wears this shoe today..."
The Hottest 3rd goods packaging~ that's the box it all comes in (not what it's MAILED in, but what the goods themselves are in. The box is 27.5 cm x 20 cm x 3 cm. Everything will be shipped out on he 31st. The post also says that if your package is not received, they will not resend another package so I hope everyone got to change their addresses if they needed to!!!!! The official title for 2PM's Japan arena tour has finally been decided, along with additional tour dates and other tour details! This is general information. Please visit their official JP website (2pmjapan.com/live) for further details not posted here. Up: You mentioned about performances twice already, would you call yourself a superstar? NK: A superstar is what other people call me. But for 2PM or myself we are a ‘Performing Group’. 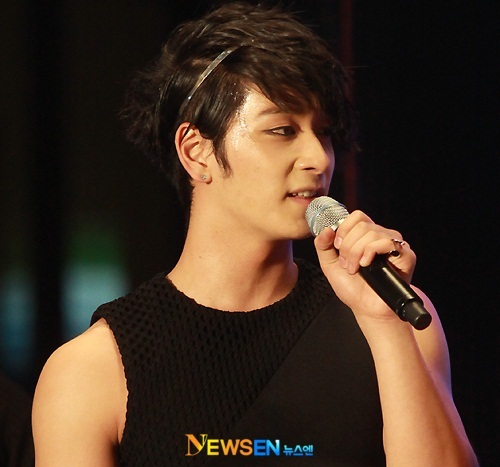 Up: Have you ever talked to Chansung, Taecyeon, Wooyoung, Junho or Junsu about where you would like to set your goals? NK: We would like to go around the world. We would like to show people in Europe, Africa, America what we have. The one thing I’m really proud of wherever we perform is when fans hold up "Nichkhun" signs in Thai, and these people are not even Thai. Instead they are foreigners who practiced writing and speaking in Thai so that they would be able to say to me “Hello Nichkhun, I love you, I love Thailand”. When that happens, it feels really overwhelming, I cannot put it in words. Up: When you visited Japan, a Japanese TV station ran a story about how you created Thai Fever in South Korea. Can you tell us about that? NK: This is something I’m really proud of, very honored as well, because the Korean fans are interested in Thai culture. They learnt how to cook Thai food and to speak Thai so they could greet me in Thai, some made Thai food for me too! But deep down, I think that for many Thai artists, if they’ve had the chances that I had, they would definitely do much better than me. I really believe that. I know where I started from, I started from zero,I had noting. Some examples such as; Bodyslam, if they had the chance to represent Thailand on the Asian stage or even just in Korea, I’m sure they will be able to succeed. They are talented and I’ve been following them since the first album, or Ben Chalatit, his voice is that good. These people truly have the potential. Koreans love the Thai people, they would go far. Up: Meanwhile, many Thai teenagers are taking Korean classes because they like K-pop artists. Is there anything you would like to tell them? Up: On Twitter your are following a writer named Paulo Coelho (@paulocoelho). Do you like to read his book as well? Up: What religion do you believe in? NK: Buddhism. Unfortunately I don’t have much time to visit temples, but when I was young I use to be a Buddhist novice. Back then I wanted to play with my friends but when I ordained I felt calm and peaceful. Up: I can’t help but asking, what would you be doing if, today or in the future, you are no longer a member of 2PM? NK: I would like to take cooking classes (beams). I want to be a chef. Cooking is an art which can be eaten, it is tangible and it can make people happy which is something interesting. I’m thinking that if I have 2 years I would like to seriously take cooking courses. I want to cook Thai food, and might open my own restaurant. NK: Umm, good idea. I’ll use that name then (laughs loudly). It should be fun. Up: What are you able to cook now? NK: I can cook some Spaghetti (translator note: in Thai, spaghetti = pasta). I want to cook Thai food but I can’t do it oversea. It’s hard to find ingredients such as; basil, galangal, lemongrass and lime leaves. Up: Your sister, Sherleen, is interested in the entrainment industry. Is there anything you told her? NK: Yep, I told her that in this industry, to be honest, there are many things that are unreal. There is nothing stable, people might love you today but one day if you do just one thing wrong, some might stop liking you. It is something that you need to be careful of. I always tell Sherleen that no matter what you do, you need to know who you are, where you came from and how much effort you need to put in. Up: You answered each question quite seriously. Are you actually a lighthearted or a serious person? NK: I have both sides because I wasn’t a spoiled child. I was far from my parents since I was young. I left home and went to study here and there since I was 12. Most of the time I lived in new cultures and that taught me to have responsibility, to have courtesy. So if it is something serious I would be more intense. Many people told me that I’m the most mature in the group. If it’s about work I admit that I’m very serious with it. Up: Talk about the big hit Hands Up. NK: This 2PM album is very relaxed. There is less choreography than the previous one. We are more confident in expressing them. We are together for a long time so we work smoothly. There is not much somersault too. The concept is to be an entertainer, to entertain the audience. Up: Now in the music industry, featuring with other artists seems like a trend. If possible who would you like to work with? NK: There are many people. Like with ETC, I appeared in their MV and they invited me to sing with them. They said that they would compose a song for me. Boyd Kosiyabong is another person I dreamed of working with. Another person is Tor Saksit, we talk to each other often. I told him that we should collaborate but each of us is very busy. I have quite a number of projects elsewhere but if possible I would like to release something in Thai, I want to sing for Thai people. The kind of songs I’m thinking of is soft-toned with a piano sound. Up: You are the person which many people want to meet, to take a photograph with. What about you? Who would you like to take a photograph with? NK: Many people. I listen to Thai music and follow many Thai Artists. I liked Palmy since I was young, since from her first album, but I never have the chance to meet her. I would like to meet her, take some photos with her and ask for her signature. Up: In 2012, what movies are you starring in? NK: It’s still in the process of preparing, there should be some good news soon. I can’t reveal details just yet, but it’s a Thai movie. I’m appearing in a Japanese movie too, as a guest. Up: Have you ever met Rain in person or hung-out with him? NK: Yes I have. We went bowling together, it was fun. He is a very nice and disciplined hyung. We talked about work and this and that. He said 2 words that I remembered; those two words were “World Class”. Up: You are handsome and have a great figure. Have you ever been embarrassed? NK: I have (he whispers). There’s this one time I have so much pimples. It’s better now. I was so stress, I was like, what’s going on (laughs)? Up: From zero, you’ve travelled the distance, in life, is there anything that is still a challenge to you? NK: (Sits still thinking) Hollywood. It is something that I think about all the time. It would be my pride to go that far, as an Asian and as a Thai. If I can go there people would know more about Thai people, about Thailand. Up: If you have to practice harder, prepare more rigorously, suffer from more lack of sleep. You’ll do it. NK: Yes, definitely yes. There are hundreds of obstacles ahead of me before I reach my goal. Whenever the first challenge is ready for me, I’ll attempt it. If I do it and I know that I did good enough, if it’s “hmm… I can handle this”, I’d continue. The interview has ended but stay tune for more! Since they travel back and forth to Thailand so often, the 6 boys of 2PM are especially familiar with Thailand and their Thai fans. When they found out about the big flood in Thailand, Nichkhun Horvejkul volunteered to be the boys' representative, bringing clothes and personal items of his own and his 5 other members to be auctioned off to fans, with all the money raised going to the flood relief effort. The auction raised nearly 900,00 baht (almost $30,000 USD), and in addition to the donated money from fans of about 180,000 baht (almost $6,000), 2PM and their "Hottest" fans have raised over 1 million baht to help flood victims. “Angle” means perspective, simply stating...people will always be more interested in every angle of a famous celebrity’s life. What do you think it will be like if we got the chance to speak with one of the biggest superstars in Asia about the different angles of his life? We will learn about many angle of his life - angles that no one has ever asked him about, angles that he has never revealed, and angles that people are waiting to learn about – Nichkhun Horvejkul. His most recent trip to Thailand was as the role as the presenter for Samsung Multiview camera. Nichkhun has an exclusive schedule with many levels, and he had less than 48 hours to be in Bangkok before leaving to promote 2PM’s newest album in many different countries. UP2U was very privileged to be able to work with this well-mannered superstar. Before the interview started, Nichkhun stopped by to give a smile. He told the staff, “I’m very excited because I haven’t had a long sit down interview with a Thai media in a very long time. I really miss answering questions in Thai.” I figured that when Nichkhun talks to others, he calls himself by “Khun” (which in Thai also means “you,” so it can be very confusing for other people to hear initially) and it wasn’t long as I saw him go back and forth greeting people that this young man was very well-mannered and truly cared about the staff members that he works with. The “aura” of this 23 year old shined brightly throughout the room. Have you ever felt…when you sit in front of someone like spotlight just shines on that person? Twenty minutes later, he wasn’t going to come and sing and dance for us, but he was going to sit down and answer the questions that I have prepared…questions that allow us to see the angles that people want to know about this Asian superstar…questions to the answers that you have never heard before. Up: You are now the presenter for a camera. In your real life, do you like to take pictures? 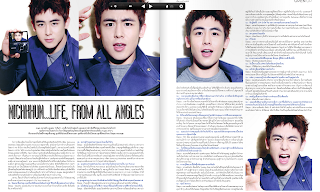 Nichkhun: I do like to take pictures, I like to capture memories. Like they say, the only things left are the images we capture. Up: I want to know what kinds of pictures you like to take. Nichkhun: I always have a camera with me. I like to take pictures at angles that other people don’t like to take. (laughs) Because taking pictures is pretty independent, I try to be creative. Sometimes I hold the camera up high and take a picture, sometimes I take a picture that isn’t in a normal line of sight (he imitates the gesture), and sometimes I take a picture from the level of the ground. When I show it to my friends, they wonder how I got that kind of picture (smiles). They ask me if I lay on the ground to take the picture or climb up stairs because it’s hard to tell. Like you can see from the CF that just aired, I had fun taking pictures from weird angles. The Samsung Multiview really matches with my picture taking style, others are more likely to be confused about which angle I take pictures from. Up: Do you like to take pictures of yourself, because on the internet there are lots of your self-portraits? Nichkhun: I call that Fan Service. If I see something I like I will take a picture and upload it. Sometimes I like to take pictures of myself and post it, so that’s why there are a lot of funny self-portraits. When I took pictures with this camera there was a function to edit the pictures, so sometimes I edited them; it was really convenient. It made taking pictures a lot easier and more fun, and made me want to go out and take more pictures. Up: You have had your picture taken a lot. Do you have any techniques when others take your picture to make yourself look cool? Nichkhun: If I know where the camera is, I try not to look. The cameraman will know how to get a good picture himself. Up: Your mom just told me that before coming here you went to Siriraj hospital. What did you do there? Nichkhun: Last week, my mom called me and told me that there was going to be a breast cancer event because Thailand is one of the countries with the highest rates of women with breast cancer. When I heard this, I was really surprised and worried, so my mom suggested that I come support this program. So when I got to Thailand, I went to Siriraj hospital; I talked a bit and did some interviews with my mom. It was very fun. Up: When you come to Thailand, there are media from Seoul who come too. The pictures of you in Thailand seem to be of you with your family and you seem very relaxed. Nichkhun: When I come to Thailand, for almost every trip, it’s not for vacation. I come often, but I come to work. On some days I am lucky and work ends early and so I am very happy. (laughs) I use that very short amount of time to go be with my family. At those times I am very happy; it’s like getting to recharge myself. When I come to Thailand, I usually stay at a hotel that they prepare for me; I don’t usually get to sleep at home at all. My mom or family members will come hang out with me and I am very happy then. Nichkhun: My mom bought that wristband for me and she told me “Wear it, honey.” My mom told me the origins of it and I was very touched. From that moment on, I wore it all the time. I feel very proud to be Thai. I am just like everybody else and really love the King. Whenever I go on a show, I will wear it, and I will wear a shirt and tell others to love the King too. To me, the wristband also means “I love Thailand.” When I am over there, I try really hard to keep up with news in Thailand. Up: Your mom told me that on your family trip to Hua Hin, you told the car to stop suddenly. Everybody in the car was confused. What happened? Nichkhun: Yes, yes. (smiles) We were driving over a very big bridge. Those who have been to Hua Hin should remember that on the bridge there is a sign that says “We heart the King.” It’s a very cute bridge. When we went past the bridge, I told the driver to stop, and everybody was confused. I ran pretty far back in order to take this picture. I wanted a lot of people to see this picture. I was running til I was out of breath. I took a picture and uploaded it onto Twitter. Up: Today you are an idol for teenagers across Asia. I want to know how idols give themselves strength. Nichkhun: I will think of my family: my dad, my mom, think of the people who love me. I believe that no matter who you are – rich or poor, talented or not – no matter who are you, there will be someone who loves and supports you. As for me, I know who those people are, and I will think of them. Up: Have you had this feeling for a long time? Nichkhun: Pretty long time. This was a turning point for me when I was started as a trainee at JYP 3 years ago. I knew it was going to hard, rough, and a new starting point, and I was constantly thinking about quitting. If I were to quit, I would have been fine…but there would be others who would be sad. Working in this field for a decent amount of time has taught me that if I fall or am distraught, that I don't fall by myself because those who love me will also fall, physically and emotionally. But if I can run, I can jump, and I am strong, the people who are here (he makes his hand into a fist and pounds it onto his chest), will also have strength with me. Nichkhun: Because others believe in me. For the many years that I traveled to Korea and met lots of different people, I learned that those who are idols, those who are superstars, are not doing it for themselves. They live for others, they live for making others happy, they live for the people who love them, live for those who are going to give more than receive. Their work is done for success, for the happiness of the audience, so they have to put in their all into practicing. Before, I didn’t know this. I know where I came from, and I knew I had to find it and build it up because I am a performer that has to convey a message, and it was then that I started to believe. Up: What has the founder of JYP, Park Jin Young, told you? Nichkhun: He has told me a lot of things. I learned a lot from him. He tells everyone in the company not to waste your free time sleeping, eating, playing with friends, or having fun. The purpose of being human is to use your time purposefully as much as possible. Up: What else did he tell you? 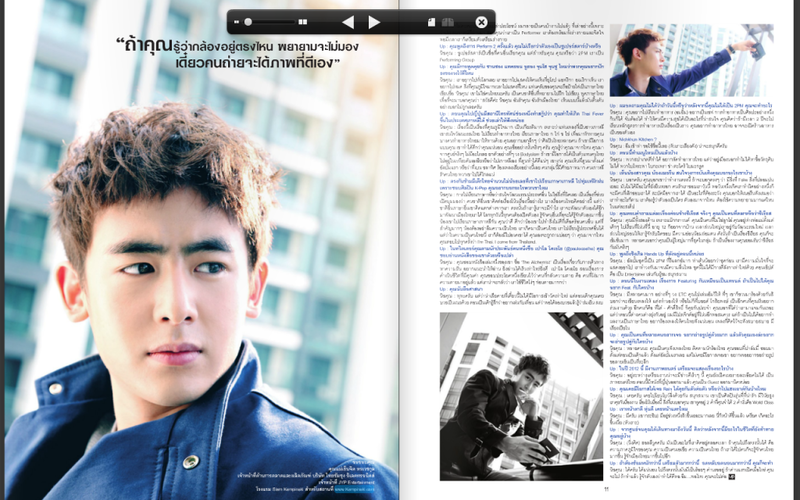 Nichkhun: Since the beginning, he said when being a celebrity, don’t try to be a good person. Nichkhun: Because trying to be a good person isn’t good. Being a celebrity, honestly, is about creating the image “I’m a good person” like this and that. But if one day, it turns out that we’re not really that type of person, and our true personality is exposed in a picture or video, what are we left with? Don’t be someone like that. But be a good person who is not fake and nothing will be able to bring us down. Thinking like a good person and acting like a good person is like a thief who becomes a monk and pretends to be a good person. One day someone will find out that he is a thief who is pretending to be a monk; it’s even more devastating. Up: That follows your concept: Nichkhun who has a goodness as a foundation. Nichkhun: I have to thank my mom and dad for that. Up: Today, how much do you have to practice as 2PM? Nichkhun: There’s an easy way to think about it: one show, one month of practice. Up: What work are you focusing on now? Nichkhun: Right now I am abroad more than I am in Korea. We are currently on our Asian Tour traveling to many different countries. We have work in Japan and China, we are performing at different places in order to promote our new album Hands Up. Up: Many fans want to know when you go on tour, what is your life like? Nichkhun: We lack sleep. (laughs) We have to manage our time both for traveling, preparing to perform for each show, and meeting our fans. Before each piece of work is released, we practice very hard. We practice until it’s in our blood. When the time comes, everything will fall into place. You can say that we practice until it becomes natural instinct. On our schedule, we practice until 2AM, and then after that we go record in the studio until 6AM, and then meet at 9AM, and get our hair and makeup done and go to our next schedule. We really get about 3 hours of sleep each day; we would do that for weeks. Nichkhun: For those who are waiting for us, for our work. Up: You had said once in an interview that when you’re not working you like to be relaxed, and just be in sandals and going to various places. When you are in Seoul or Bangkok, do you get to do that? Nichkhun: (Laughs loudly) I do. I do have time, but it’s hard to believe. (smiles) On days when I have more free time, I will go work out or go practice, and go fix the areas of myself that I am not yet pleased with. I think if I have time, I shouldn’t waste it with no purpose. I think I've become a workaholic. I say this because my experiences have taught me that I am a performer and so I have to be ready both physically and emotionally, so when I have time I prepare myself. Up: You have talked about being a performer twice now. You don’t call yourself a superstar? Nichkhun: Superstar is what others call me. But for me, I and 2PM are a performance group. Up: Have you ever talked with Chansung Taecyeon Wooyoung Junho Junsu about where you want to stick your flag on the ground? Nichkhun: We want to go all over the world. We want to perform for people in Europe, Africa, America - we want to go everywhere. The thing I am most proud of when we go perform elsewhere is when my fans hold light signs of my name in Thai. And they’re not even Thai, they’re of other nationality who went to practice to read and write Thai in order to come tell me in Thai “Hello Nichkhun. I love you. I love Thailand.” When I see this, I am truly touched beyond words. Up: When you went to Japan, one TV company did a scoop that you caused South Korea to have “Thai Fever.” Please explain this to me. 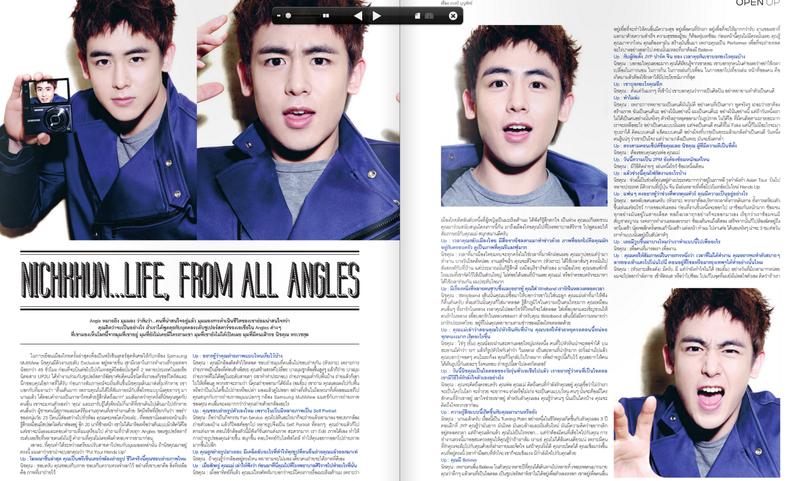 Nichkhun: This is something that I am very proud of. It is really an honor that Korean fans have an interest in wanting to learn about Thai culture, learn how to cook Thai food, and learn the Thai language A,B,C in order to come greet me. Sometimes they cook Thai food for me as well. I want to say that deep inside I know that if other Thai celebrities were given the same opportunity as me, they would be able to do a much better job than me for sure. I really believe that. I know where I came from; I truly came from zero, I really didn’t have anything. For example, the group Bodyslam (a rock group in Thailand), if they had the opportunity to represent Thailand and to be able to go on an international stage or Korean stage, P’Thoon (one of the members of Bodyslam) would be great for sure. He’s very talented. I’ve followed P’Thoon since his first album. Or even P’ Ben Chalatit, he’s such a great singer. The members of this group have it all. Korean people love Thai people, so these people would be able to go far. Up: On the flip side, there have been a lot of Thai people who have learned Korean and devoted themselves because they love K-pop. Do you want to tell them anything? Up: On twitter, you follow one novelist named Paul Coelho (@paulcoelho). Do you like to read his books? Nichkhun: I like one of his books, “The Alchemist.” It’s about chasing after your dreams. I highly recommend you to read it. The sooner you can read it, the better. He teaches you how to live a life with meaning. I really like one thing he said about someone who fears death is someone who is stupid. Death is already on its way, but instead of fearing it, we should fear living a stupid life before death comes. Up: What religion do you uphold? Nichkhun: Buddhism. But unfortunately, I haven’t had time to go to the temple recently. When I was a kid, I was ordained as a young monk (called a “nane”). When I was a kid I liked to play around with my friends, but when I was ordained, I understood what it was like to be calm and be peaceful. Up: I really can’t help but ask if one day you were no longer part of 2PM, what would you do? Nichkhun: I want to learn cooking. (smiles) I want to be a chef. Cooking is one form of art; you can eat it, decorate it, and make people happy with it. I think that if I had 2 years, I would go officially study cooking. I want to cook Thai food. I might even want to open a restaurant. Nichkhun: Sounds good. I think I’ll use this name. (loudly laughs) It should be fun. Up: What kinds of food have you made already? Nichkhun: I can make various spaghetti, but I really want to learn to make Thai food, but living abroad, I can’t really make it because it’s hard to find the ingredients, like basil leaves and lemongrass. Up: It seems like your youngest sister, Cherleen, is interested in the entertainment business. Have you told her anything? Nichkhun: I have. I told her that if you’re going to work here, I told her truthfully that there are lots of things that are fake. There is nothing that is permanent. People can love us one day, and another day when we do something wrong, then there will be people who will stop loving us and just brush us aside. It’s something that we all have to be careful about. I tell Cherleen all the time that no matter what we do, we have to remember who we are, where we came from, and how hard we have to try and practice at each step. Up: You have answered each of these questions very seriously. In reality are you a funny or serious person? Nichkhun: I have both sides. From my background, I am not really a Mama’s boy. I have lived far from my parents since I was a kid, learning in different countries. At the age of 12, I was already living alone. Most of the time, I am living in a new culture. This has taught me responsibility and humility. So if it is a serious matter, I will be very serious and strict. Many people say that I am the most adult of the group. If it’s about work, I admit that I am very serious about it. Up: Talk about the single Hands Up that is very popular now. Nichkhun: This album shows a 2PM that is very relaxed. There is less choreographed dancing. We wanted to just perform. We’re not doing much acrobatics in this song. The concept is just to be an entertainer, play with the audience, and just have fun. Up: In the entertainment industry, it seems like the trend is to have other artists featuring. If you got to choose, who would you want to feature with? Nichkhun: There are lots. For example, the group ETC (a Thai group), I acted in a music video for them. They also invited me to sing with them, they said they would write and compose a song for me. Or maybe P’Boyd Kosiyapong (a famous Thai composer) is someone that I dream about working with. Another person is P’Tor Saksit (a Thai singer, the person who was in the Brand CF with Khun). We talk with each other all the time, and I’ve told P’Tor that we should jam together sometime, but currently we are both busy with our own work. I still have lots of projects over there. But if it would be possible, I would like to have some works in Thai. I definitely want to sing for Thai people; perhaps a song that is easy to listen to with maybe a piano in the background. Up: You are someone that many people want to meet and take a picture with. What about you, who do you want to take a picture with? Nichkhun: Many people. I am someone who listens to Thai music and follow a lot of Thai singers. I really like P’Palmy (a Thai singer who has a more hippy style to her songs), I’ve listened to her ever since I was a kid, ever since her first album. I want to meet her, to take a picture with her, and to ask her for her autograph as a keepsake. Up: In 2012, is there a movie that you will act in? Nichkhun: It’s in the works, there should be good news soon. I can’t reveal the details yet. It’s a Thai movie. There is a Japanese movie coming out soon, and I guest star in a small role. Up: Have you had the chance to meet Rain, to speak with him, or hang out with him? Up: You are good looking and are fit. Have you ever been embarrassed? Up: From zero, you were able to work up to this point. What other challenges would you like to tackle? 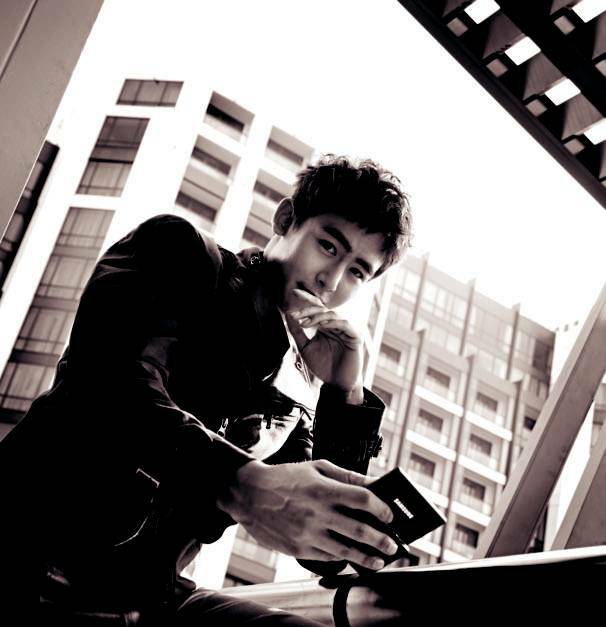 Nichkhun: (He sits still for a moment to think) Hollywood. It’s something that I am always thinking about. If I am able to get to that point, I would be very proud as an Asian person, and as a Thai person. If I were able to get to that point, people would know more about Thai people, more about Thailand. Up: If you had to work harder than this, practice more than this, lose more sleep than this, you would do it. Nichkhun: That would be okay. That would be okay for sure. To get to that point, there will be hundreds of opportunities waiting. If one opportunity opens, I will go. I know myself that I can do it hmmm….I think I can manage. I will keep going further. *After reading the script, thoughts on your role? -He’s a physical type. Which makes him reserved and brusque, under the surface, if you look at how he saves his peers or other things he does, you could think of him as a hunter. -Since the action director gave me really amazing action scenes I’m really happy..uhm…It was fun. -Matsukaza-shi, fukushi-shi and oomasa-shi, all three of them warmly speak to me so I’m really thankful. The atmosphere is really good. *when you hear [phantom], what image do you think of? *If you became a [phantom]? -I would steal time and (if I gave it) to myself I would either work out, study Japanese or other good things I want to do. This is my first Japanese drama so I’ll really do my best at the role of “Jack”. Everyone, soon [Kaito Royale] will start. Please anticipate it…goodbye! Thailand is currently suffering from a serious flood for the first time in fifty years. 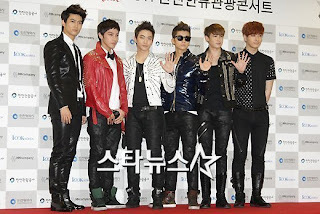 2PM and their agency JYP Entertainment donated 130 million one to the Red Cross for Thailand. 2PM members will help Thailand a lot. Their agency said since Thailand is Nickhun’s country, other members also care about the country as well. 2PM is currently touring Asia. They will hold concerts in Indonesia on November 11, Singapore on the 19th, Malaysia on the 25th, Philippine and Beijing on the 27th, and Japan in December. VOTING TUTORIAL: After successfully signing in go here to vote http://kpopwave.joinsmsn.com/starranking/golden_vote.aspx. Scroll down and look for 2PM. Another box for an event will pop up. Just click 'x' and you're good to go. Feel free to take out this tutorial and re-post. An official from the Red Cross reported that "On the 20th 2PM and JYPE Entertainment donated 130 million won to the Thailand flood damage recovery fund". Since the end of July Thailand has suffered flood damage to 70% of the country and 342 people have died during some of the worst flooding to have occurred. Since 2PM's debut they have experienced a lot of popularity in member Nichkhun's homeland, Thailand. Because of this Thailand is considered a special country to 2PM. But after seeing the pain of Thailand's people caused by the unprecedented flood damage the members decided to donate their own money. The warm hearts of JYP Entertainment decided to provide support, and so generously donated 130 million won to the flood damage fund. Last March they also warmly donated 300 million won to the earthquake damage fund in Japan. 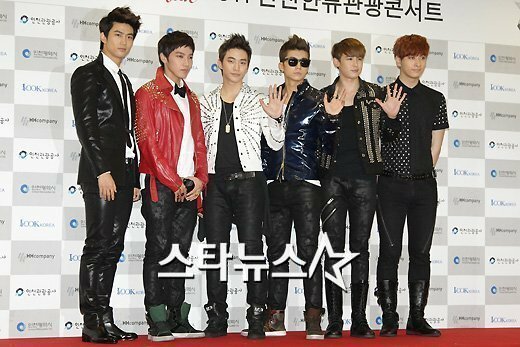 2PM are currently undergoing promotions in Japan. 2PM come forth for Thailand that's suffering from the worst flooding in 50 years. During 3 months of worsening damage and casualties due to flooding in Thailand 2PM and JYP Entertainment donated 130 million won through the Korean Red Cross. JYP Entertainment said on the 24th "Nichkhun's homeland Thailand is one of the closest countries to 2PM. After learning of the terrible news the members sent their own support fund". The 2PM members are dedicated to helping with the flood damage in Thailand. As well as being where Nichkhun's family home is, Thailand is also a special country to the members. Meanwhile 2PM is in the middle of their Asia Tour. Concerts will be held in Indonesia on November 11th, Singapore on November 19th, Malaysia on November 25th, Philippines on November 27th and Beijing, and then a national tour in Japan in December. 2PM and their fans have come forth to help Thailand who's suffering from terrible flood damage. 2PM's Thai fanclub "2PMAlways" and "2PM Love Thai People" recently held an auction event for the flood damage in Thailand. The 2PM members sent their previously worn clothes and treasured items to Thailand for the auction. The Thailand born Nichkhun's mother was seen actively participating in the event. Nichkhun's mother, who resides near Bangkok, personally took an active part in the auctioning off of Nichkhun's items in the event with the fanclubs. Through this auction 1,197,200 baht (43,900,000 won) was raised. The fanclubs plan to use the money raised to provide the people affected by the flooding with emergency relief items. Member Nichkhun is Thai and 2PM have a lot of popularity in Thailand, and so as well as the auction event they also donated money through the Red Cross. One representative said "JYP Entertainment staff and the 2PM members recently gave a donation" and "Member Nichkhun is greatly saddened by the flooding in Thailand. We hope it does not cause any greater damage". Thailand has been experiencing since July the worst flooding in 50 years; 70% of the country has been damaged. As of the 23rd 356 people have died and 113,000 people have been seriously affected. Economic loss has reached 6 trillion won. [Khun‘s Weibo] Weibo please help pray that Thailand will be better soon! Angle is defined as ‘point of view’. It is said...for an interesting person, their point of view and way of life are even more interesting. What do you think will happen, if we talk to an Asian superstar in many ‘angles’. The way he sees this world from his angles, the angles that no one has asked about, the angles unrevealed, the angles that people are waiting for, Nichkhun Horvejkul. In his latest visit to Thailand as Samsung MultiView presenter, Nichkhun has a few exclusive events in line. He had less than 48 hours to spend in Bangkok before continuing his journey to promote the second album in various Asian countries. UP2U magazine was surprised to have had a chance to work with this friendly superstar, and we are grateful for this opportunity. Before the interview started, Nichkhun gave us a friendly smile. He told the staff “I’m very excited, because it’s been a while since I gave a long interview with the Thai media. I miss answering questions in Thai.” I noticed that when he speaks, he would call himself as “Khun” (translator comment: instead of I) and we could feel within minutes that this man is polite and very caring of all the people he works with. The glow or what is called ‘aura’ of this 23 year old shines to every corner of the room. Have you ever met anyone…who sits in front of you and makes you feel like there’s a spotlight on him for the next 20 minutes. He did not come here to sing or dance but he will sit down and answer the questions I’ve prepared. The questions to do with all of the ‘Angles’ of this Asian Superstar that many people do not know and questions that you’ve never heard him answer. OK then…what can you do while adjusting your eyesight to those new angles? 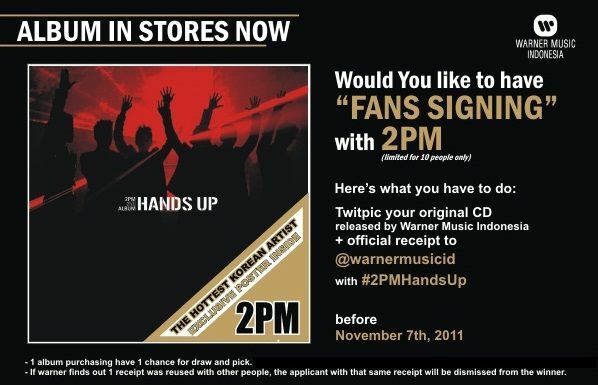 If Nichkhun was here, I guess he would tell you to “Put Your Hands Up”. Up: You were a presenter for a camera in your latest advertisement. Do you like taking pictures in real life? NK: Yes I do. I like keeping photos and memories. Like they say, only the images you’ve taken are left behind. Up: What kind of pictures do you take? NK: I have a camera with me all of the time. I like taking pictures in angles that other people don’t (laughs). Because photography is about individuality, I get creative in my own ways. Sometime I put the camera up high, sometime I take pictures from non-eyesight level (demonstrates), some other times I take pictures from a low angle. I’d show them to my friends and they’d ask “how did you do that” (smiles) “did you lie down on the floor or use a ladder? Couldn’t tell.” Like in the advertisement that was just released, I have fun taking photos in weird angles. The Samsung MultiView is suitable for my style of photography. People would wonder what camera I use. Up: Do you like taking pictures of yourself? There are many self portraits of you on the internet. NK: It is considered a part of Fan Service. If I see something I’d capture and post them. Sometimes I like to take my own pictures and post them. That’s why many of the self portraits are funny. I take photos and edit them too. This camera has an editing function, very convenient. We can edit the pictures ourselves, making our experience easier and more fun. It suits my lifestyle, making me want to take photos even more. Up: Since you have been taken photos of for countless of time, is there a trick to make yourself look good? NK: If I know where the camera is, I will try to not look at it. The photographer can take a good picture by himself. Up: Just now, your mother said you visited a hospital before you arrived here. NK: Last week my mother told me about a Breast Cancer project. Thailand ranks first in the number of women diagnosed with breast cancer. I was shocked when I found out and was concerned. So my mother asked me to support this project. I went to the hospital after I arrived to talk and give an interview with her. It was fun. Up: When you come back to Thailand, reporters from Seoul follow you too. The impression is that you seem to spend time mostly with your family, it looks very relaxed. NK: I rarely get to rest when I come to Thailand. I’m here often but it’s all work. On a good day, if work finishes early, I’ll be very happy (laughs). I get to spend that short time with my family, just a little makes me feel good. It’s like recharging myself. When I come to Thailand I mostly sleep in hotels and rarely at home. My mother or family will come and spend time with me. I really appreciate that. Up: Wearing a “We love the King” wristband is the one thing many people appreciate and want to know about. NK: My mother bought that wristband and told me to wear it. She told me about its origin and I was touched so I wore it ever since. I feel extremely proud to be Thai. I love the King, like other people. I wear it to any event. I wear it to invite other people to love the King, to express our love for the King. For me, this wristband also represents my love for Thailand. When I’m over there I always try to follow Thai news too. Up: Your mother told us when you went to Hua Hin with your family, you told them to stop the car. Everyone was confused. What happened? NK: Yes, yes (smiles). We were passing a large flyover, if you go to Hua Hin often you might know. On the flyover said “we” followed by a heart then “the King”. It was adorable. The car already passed and I said stop stop. People in the car were confused. I ran back a very long way to take that picture. I want more people to see this image. I ran until I was panting to take it and posted it on Twitter. Up: Today you are an idol for young people all over Asia. We’d like to know how idols motivate themselves? NK: I’d think of my family; father, mother, people who love me. Would you believe that no matter how rich, how poor, how talented, no matter what kind a person is, there will always be someone who loves them and gives them support. For me, I know who they are and I’d think about them first. Up: Has this kind of thought occurred to you for a long time? NK: It was long ago. This was one of the turning points in my life. The 3 years spent as JYP trainee was tough and harsh. It disregarded all my past and presented a new beginning. I had an urge to quit all the time though. If I quit, I’m alright…. but there will be people who are disappointed in me. Working here taught me that if I fail, I’m ruined. But I’m not the only one who falls. Both the body and soul of people I love will fall with me. But if I can run, if I can jump, if I get stronger, the people here (thumps his heart with his fist) will also be stronger. NK: Because other people believe in me. The many years that I’ve traveled, I’ve met all sorts of people. I think that, deep down, idols do not do live for their own selves. They live for other people, they live to make others happy, they live for those who love them, they live to give more than to receive. Their successes, and the audience’s joy, come from commitment in practice. I did not have that before. I know where I came from. I had to search for it and build it. Because I’m a performer I have to deliver my message, that’s when I must have a belief. Up: What did the JYP founder, Park Jin Young, say to you? NK: He told me a lot of things and I learned a lot from him. He told everyone in the agency to not waste your time in sleeping, eating or playing around. Our duty is to make the most of our time. NK: Since from the first days I went in, he told me that being an artist, you should not act like a virtuous person. Up: Why is that so? NK: Because trying to act virtuous is not good. Honestly, entertainers have to build an image: that I’m a good person and all, but if we are not truly like that, our true selves will slip out in images and videos. There are plenty of people following us, what do we have left then. Don’t be that kind of person, just be a good person. A good, honest person. Nothing can bring us down when we have this. Think like a good person, act like a good person. A thief can disguise as a priest and pretend to be virtuous. One day people will find out he is a thief and that will bring him down. Up: Just like your name, Nichkhun, meaning a person who has virtue as the pillar. NK: I have to thank my father and mother for that. Up: How hard do 2PM have to practice still? NK: Easy way of thinking, one show is one month practice. Up: What’s the focus on your work right now? NK: This period I spend more time abroad than in Korea. The group is on an Asian tour in many countries. 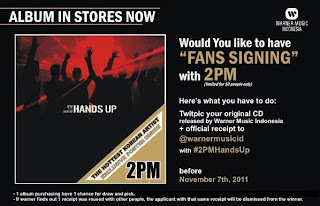 We have work in Japan, China, and many performances for the promotion of Hands Up album. Up: Fans would probably like to know how you live when you are on tour. NK: Lack of sleep (laughs). We have to manage our time in travelling, preparing, performing and fanmeeting. Before a song is released, we work very hard. We practice so that it’s runs through our blood. When the time comes everything will work out. Let’s say we practice until it becomes instinct. Our work cycle is practice until 2am, then stay in the recording room until 6am, meet again at 9am, put on makeup, do our hair, then continue working. We sleep for only 3 hours, and we do that for many weeks. Up: Have you ever thought for a moment why you are doing this. NK: For those waiting for us, for work. Up: You said in an interview that if you are not working, you would like to relax and walk around in flipflops. Have you had a chance to do that in Seoul or Bangkok? NK: (laughs loudly) Yes, I’ve had. But I cannot get myself to do it (beams). On days that I’m quite free, I’d exercise, hit the gym, or practice and correct in areas where I’m not satisfied with myself. If we think we have time, we should not waste it. I’ve turned into a workaholic. I say this because experience taught me that as a performer, we must be both physically and mentally ready. When we have time we should prepare physically.